National Park "Burabay" is the recreational pearl of Kazakhstan. 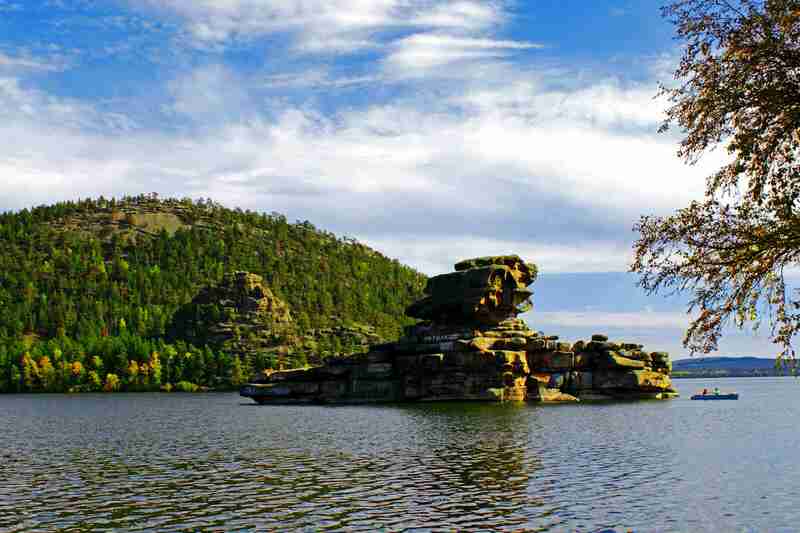 It is in the North of Akmola region in the mountain district filled with mystical miracles. 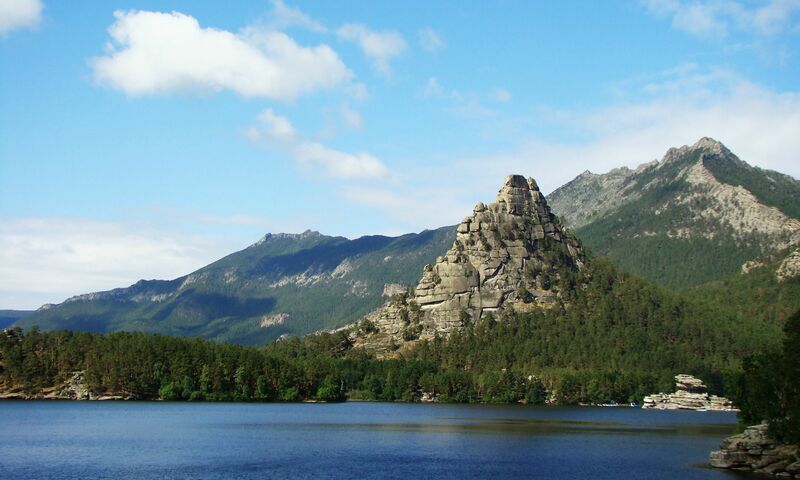 Magnificent pine woods, enormous rocks, fantastic tops separated by silent lakes. Local guides proudly call this place – "Kazakh Switzerland". State national natural Park was created in August 2000 and is administered by the office of the President. The territory of SNNP "Burabai" is a part of Kokshetau steppe, steppe and fine-knoll hill. The climate is continental, with hot summers and mild winters. The relief of the territory represented by low mountains, hills and plains. In the Park there are 14 lakes with the water surface area of about 1 square kilometer each and a large number of smaller lakes. Vegetation in the Park is represented by forest, steppe, meadow, marsh and saline types, the flora totals about 800 kinds of plants. Vertebrate animals are presented by 305 views. The highest point of the area is Kokshetau mountain (Blue mountain). South mountain is situated Burabai (690 m) is an excellent panoramic point. Burabay is a camel. Further South more are situated Shuchinsk mounds, the biggest of which is called zheke-Batur – a lonesome fighter (826 m). We cannot help but mention the lakes of Borovoye. Here each name is a legend. There is an old legend about Borovoye. It tells about how Allah created the world, cheated the Kazakh, giving him only steppes. It was offensive to Kazakhs, and he asked the Creator to give him a part of beautiful nature. And then Allah's scraped from the bottom of his bag and scattered amidst the boundless feather-grass steppes the remains of picturesque mountains, rocks and lakes with crystal clear blue water, scattered with generous hand emerald meadows covered with flowers, keys with icy cold water and merrily murmuring Brooks. Lastly, he settled forests with animals and birds, lakes with fish and meadows with insects and butterflies which could not be met in the desert for a hundred miles around. So Borovoye was created. Borovoye is more beautiful than any tales. The combination of mountains, pine forests and lakes creates not only unique beauty of the landscapes, but also a special medical climate. The swimming season begins in June. It is also worth noting the historical significance of this place. At the foot of Burabai held a Kurultai, where Abylai Khan United the three tribes of the Kazakh people. Centuries later, in the sky above the place where the Khan headquarters was located, there was a Golden eagle. This obelisk was erected in memory of the historic event. To reach the resort by car, taxi, bus, or train. The journey time is 3-4 hours. Kokshetau is a clean, beautiful city. If you climb to the top of the hill, which is located in the South-West of the city, you will see an amazing view: to the West water surface of the lake and the beach, in the North-East extends a plain, on the South rise the hills. I want to go there, really beautiful! I think that we can consider as second Switzerland-Almaty! I visited Swiss 2 years ago, and to be honest Almaty is more pictural and atmosphere is so friendly! having visited these place many times but always want to come back - such a breathtaking piece of nature it is!! !